(2001) "Got Ur Self a Gun"
"Got Ur Self a Gun" also known by "Got Ur Self A..." for the clean versions of the album and single respectively, is the second single from the 2001 album Stillmatic by the American rapper Nas. The song is produced by Megahertz and samples The Sopranos theme song "Woke Up This Morning." It reached #87 on the Billboard Hot 100. The music video features Nas in a church confessional. It pays respect to The Notorious B.I.G. and 2Pac by depicting the two rappers being shot. 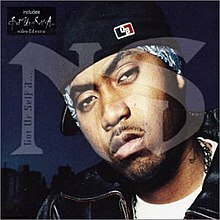 The photos transition to video, in which Nas is the actor. ^ GmbH, musicline.de / PhonoNet. "Die ganze Musik im Internet: Charts, Neuerscheinungen, Tickets, Genres, Genresuche, Genrelexikon, Künstler-Suche, Musik-Suche, Track-Suche, Ticket-Suche - musicline.de". musicline.de (in German). Retrieved 2018-07-25. ^ Hung, Steffen. "Nas - Got Ur Self A..." hitparade.ch. Retrieved 2018-07-25. ^ Hung, Steffen. "Nas - Got Ur Self A... - hitparade.ch". hitparade.ch. Retrieved 2018-07-25. ^ "Nas Chart History". Billboard. Retrieved 2018-07-25. ^ "NAS | full Official Chart History | Official Charts Company". www.officialcharts.com. Retrieved 2018-07-25.